Summary: We suggest a series of questions that on how to select a dog breed that is best for you. Specific questions relating to the change of lifestyle and expenses that often accompanies the maintenance of a dog and its impact on your lifestyle. It is best to do some serious thinking before ever looking for a puppy. If you don’t think first you may choose a darling St. Bernard puppy. They are fluffy, cute and adorable. St. Bernard puppies are perfect if you have the room; however, if you live in a small apartment it won’t be in a month or two and the puppy will definitely outgrow the apartment. This kind of set up would not be fair to a puppy that needs a lot of room to romp and play. We have compiled the following list of considerations on how to select a dog breed that is best for you. How big or small of a dog do you want? How big or small of a dog can you properly take care of? Do you want to spend a lot of time brushing a pet? Do you have extra money to have a pet regularly groomed? Are you allowed to have a pet in your residence? If you do not have a fenced in yard, where will you take your pet to do his business? Are you prepared to clean up after your dog? Where will you put the business that you pick up? Are you prepared to be responsible for your dog’s actions in case he chews up the neighbor’s property? Are you prepared to make regular visits to a veterinarian for vaccinations, worming, parasite control and spaying/neutering? Do you jog and enjoy getting out when you have free time or do you prefer to read, surf the internet or be a couch potato? 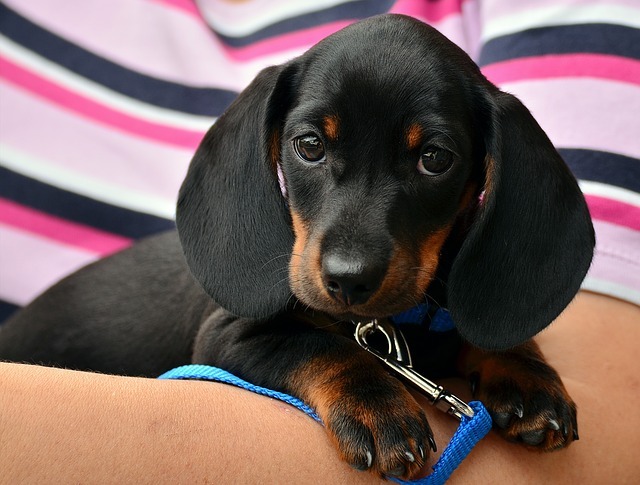 Do you have time to properly socialize your dog? This will mean taking him for lengthy walks and exposing him/her to many different opportunities. Do you live in the city, country or suburbs? How much money are you planning to spend to buy your pet? How much can you afford to spend on dog food monthly? I’m confident that this is not the entire list of questions that any responsible dog owner should answer before making the purchase. However, it is a great starting point. We suggest that you find out about the different breed types and their needs then try to match them closely with your own. There are seven different AKC groups. Each group contains different breeds that have a somewhat common bond. HERDING DOGS: These dogs have an instinct to herd even their owners and especially the children. These dogs are intelligent and make excellent companions. They respond easily to training. HOUNDS: Hounds have acute senses of sight and smell, and are able to follow a trail. Some hounds bay instead of bark if you have close neighbors you may wish to consider this. NON-SPORTING: This is a very diverse group. This group has an equally diverse number of personalities and appearances. If you are considering a dog out of this group you may want to consider what the particular dog was bred to do. SPORTING: Sporting dogs are naturally alert and active. They do require a lot of invigorating exercise. The sporting group makes very like-able companions. TERRIERS: Terriers have very distinctive personalities. They are very energetic dogs that were bred originally to hunt and kill vermin. Most of the terrier group has wirehair. TOY: Toys are perfect for lap-dogs. They work well in places where there is not much living space such as apartments. Toys bring a lot of pleasure and are usually much tougher than they look. WORKING: Working dogs were bred as guard dogs, sled dogs and rescue dogs. They are intelligent and need to be trained properly. This group has been super valuable to humans; however, they may be unsuitable for the average family because of their size and strength alone. If you have further comments or questions about ‘How To Select A Dog Breed That Is Best For You’, feel free to visit our Forums or make a comment on this article below. We encourage participation and feedback. As one of the most popular breed of dogs, the Yorkie, short for Yorkshire Terrier, walks proudly despite its tiny stature. Not only are they often winning show dogs, but they are one of the great companion dogs. Though characteristically bold in their activity, Yorkshire Terriers do like to please their owners very much, which makes them extremely easy to train. Part of what gives them their fame is not just their cute size but the color and texture of their silky coat. Yorkies puppies are probably one of the cutest puppies you will see. Able to sit in the palm of your hand as babies, they almost look like a little stuffed animal. Depending on the type of quality Yorkie puppy determine their adult size. The average adult size of Yorkies puppies is between 3 to 6 pounds. Yorkies should never exceed 7lbs as this would be considered oversized. Yorkie puppies walk with confidence and an air about them. They are easily trainable and adapt well to different locations. Yorkies prefer adults or older children as the like to be the baby. They can wear out even the energetic of children. They are very loving and loyal pets and bond quickly to people who care for them and love them. They enjoy being a part of the family.